Here is one bit of coverage: just a recycling of the uni press release, but on a decent site. 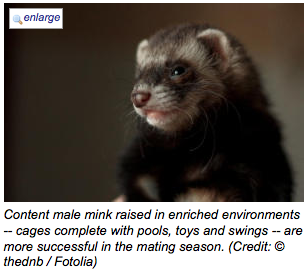 That is so not a mink though! They must have thought, “well, it’s mink-ish”. Maria’s lovely mate choice paper is out! Here is the uni’s press release, though unlike for Becky’s boredom paper, media interest has been weirdly absent (think tumbleweeds and the sound of crickets chirping). Think there’s been to much real news in the world this week, and also PLOS ONE didn’t do a release – that made a real difference last time. Ah well, I love the study anyway, and here is the paper itself. Comments : Comments Off on Maria’s lovely mate choice paper is out! 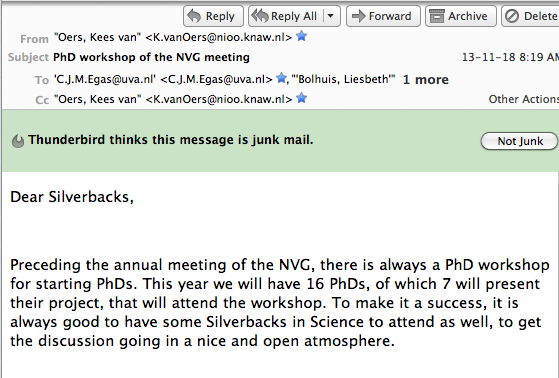 Never been called a “Silverback” before! I like it! But it’s a bit sexist; I’ve requested to be called “Matriarch” instead, and they’re cool with it. Fascinating “Philosophy Bites” find from Maria (we’ve discussed a couple of these in our group “journal clubs”, I’ve just not written them up yet…). So: ethics philosophers are morally troubled by eating mammals, but they don’t actually change their behaviour; and ethics books are highly likely to go missing from libraries! For more on how and why, click here.